Warren Stichtenoth was involved in the world of art most of his life. He was a noted artist in his native Cincinnati for his sensitive portraits of Cincinnati itself. His work depicts not only the present, but a reverent recall of the past. Much of Cincinnati's rich history was revisited through Mr. Stichtenoth's brushes. Versatile in subject matter and media, Mr. Stichtenoth worked in a number of styles and techniques. His extensive work with civic and business groups helped support a wide variety of community projects and continually challenged his creativity. 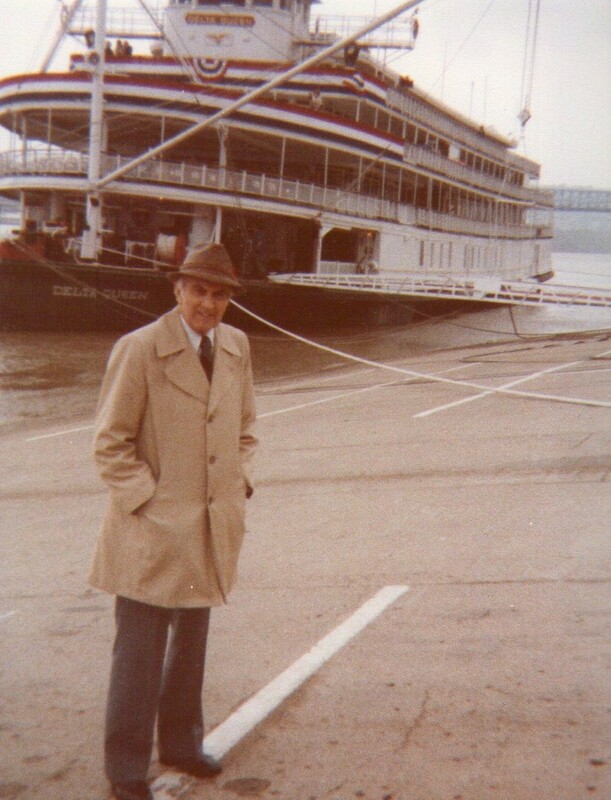 Mr. Stichtenoth had many one-man shows throughout the Midwest, beginning with one held aboard the Steamboat Delta Queen depicting life on a riverboat. 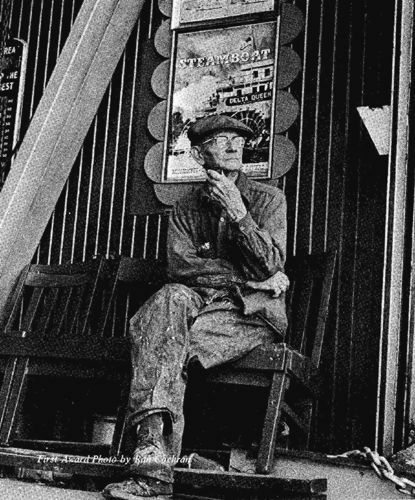 Mr. Stichtenoth was also commissioned by the State of Kentucky to do a one-man show portraying his interpretation of the Blue Grass State for a series of national exhibitions. His work can be found in a number of museums and in many private and corporate collections throughout the United States. Mr. Stichtenoth became interested in steamboats when he designed a travel agency poster for Greene Line Steamers in 1963. 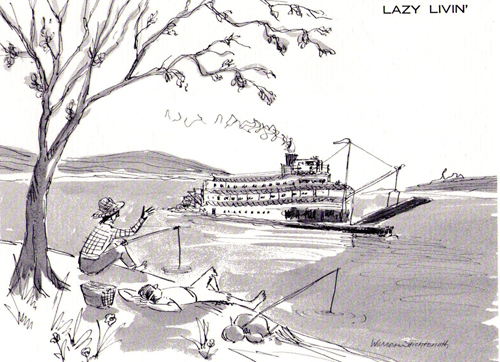 He was later commissioned to paint scenes from the Delta Queen while on a week-long cruise. He painted one scene aboard the boat each day, often drawing a crowd of people from among the other passengers to watch him paint. He also took many photos that were used to later create other painting and drawings in his studio. 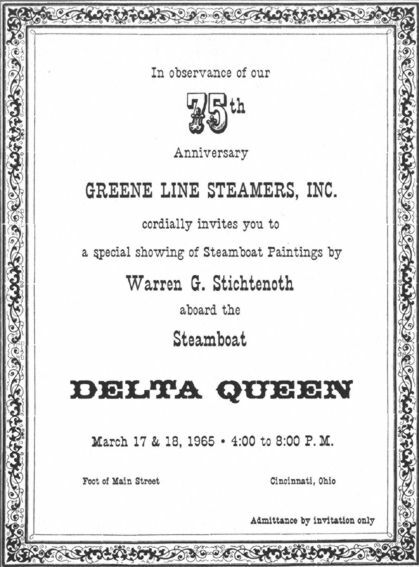 The one-man art show, celebrating the 75th anniversary of Greene Line Steamers, was held in March, 1965 aboard the Delta Queen immediately preceding the Queen's first cruise of the season to New Orleans. 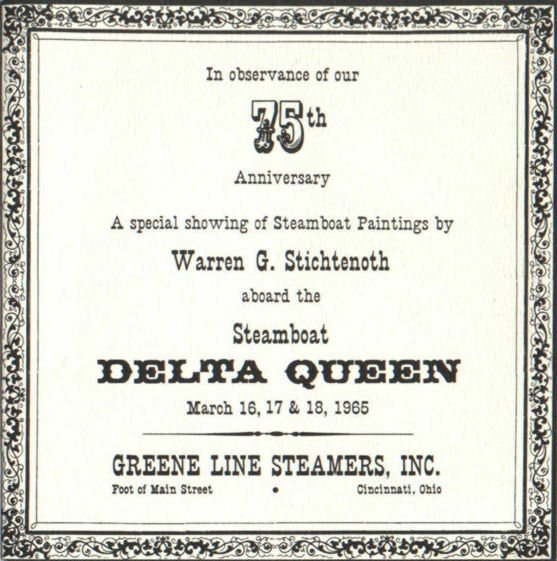 Mr. Stichtenoth also designed the 1965 calendar for Greene Line Steamers that included historic photographs of the early steamers up to the time of the Delta Queen. Click here for a complete biography of the artist, including a dedication to his life as a soldier and an artist during the Italian Campaign in World War II. Warren Stichtenoth passed away Nov. 26, 2005. Read the Cincinnati Enquirer article about his life: click here. Click here for the Delta Queen section at the Warren Stichtenoth Art Gallery on Facebook. Many thanks to Craig Stichtenoth, Warren Stichtenoth's son, for contributing the photos and information for this exhibit. This graphic shows the t-shirts that were printed for the celebration of National History Day in Mississippi. National History Day is a nationwide competition for middle school and high school students. 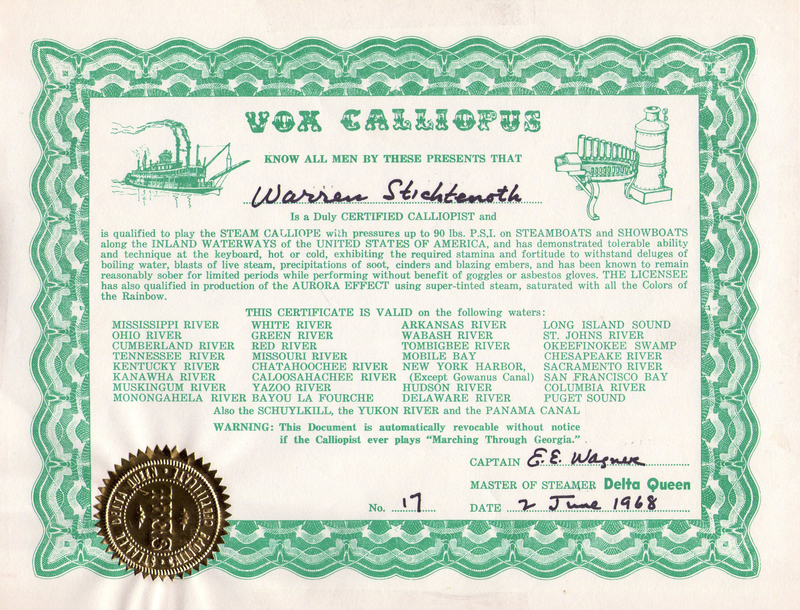 They used the Warren Stichtenoth Delta Queen logo with the permission of Steamboats.com and Craig Stichtenoth. Warren Stichtenoth's embossed graphic design for the Delta Queen. "During [the early 1960's] several exciting and unusual art opportunities presented themselves. 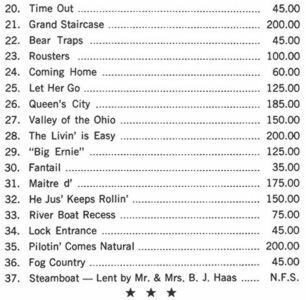 I was doing all the advertising and sales promotion for the Delta Queen Steamboat Company. In order to create a public interest in the Delta Queen, we planned a one man art show on board the boat. A first! 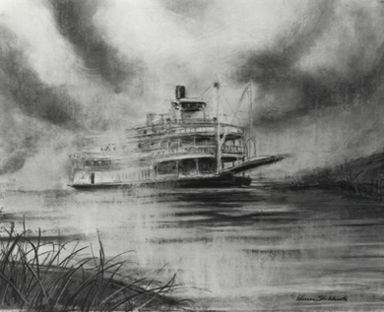 Since all of the paintings were of the Delta Queen, inside and out, her people and officers, the show became a pictorial story of the steamboat and her activities. To make the show a part of the Cincinnati scene, we invited the local school children to visit the Delta Queen and see the art show. The show then went on a tour of the American river cities and was shown in featured museums in Louisville, Memphis, Maysville, Paducah, St. Louis, New Orleans, and others. This unusual treatment for an art show brought about a special national award for Betty Blake and the owners of the Delta Queen for the most complete and effective public relations event of the year. When the show returned to Cincinnati after the Ohio River Tour, the paintings that had been purchased were made available to the purchasers. My old alma mater, Bond Hill Public School, purchased three of my paintings to include in their permanent art collection, one of the most extensive in the area at the time. I was asked to deliver them in person and at that time give an assembly for the student body. This was a most enjoyable event. It's always fun to talk about my relationship with the Delta Queen." Two examples of Warren Stichtenoth's blank note cards that were sold in the Delta Queen Gift Shop. This is the cover of the invitation to Warren Stichtenoth's art show in conjunction with Greene Line Steamer's 75th anniversary celebration. This design was used in advertisements for the art show that appeared in publications such as the Cincinnati Enquirer and Cincinnati Post & Time Star newspapers, and Cincinnati Dimensions magazine. It was also used as the cover design on the program provided to visitors to the art show aboard the Delta Queen. This is the list of Warren Stichtenoth paintings and drawing that comprised the 75th anniversary art show, as it appeared in the program. Many of these pieces are now housed in private collections. The portrait of Delta Queen Captain Ernest Wagner, entitled "Big Ernie" is now in the collection of the Cincinnati History Museum, a part of the Cincinnati Museum Center at Union Terminal. Log on: CincyMuseum.com. 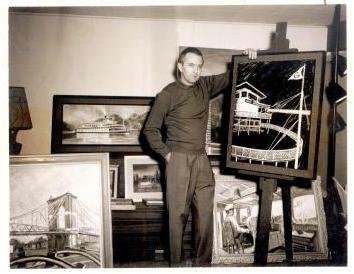 Warren Stichtenoth shown with some of his paintings, preparing for the 75th Anniversary art show aboard the Delta Queen in March 1965. "Warren Stichtenoth is a Cincinnati artist who likes to paint in unusual spots. He did a series of birds-eye views perched atop Highland Towers before the new high-rise was completed. His latest venture is a group of more than 30 oils, watercolors and drawings which he did aboard the Delta Queen. This so pleased the owners, captains, mates, and other Greene Line people that they are inviting one and all to troop down to the riverbank and hop aboard to see Mr. Stichtenoth's show Wednesday and Thursday, March 17 and 18. I hopped aboard the Stichtenoth's home in Delhi the other morning for a preview and am able to report that the work is engaging, bright, expertly executed and will have instant appeal to art lovers and river buffs. The Queen is a beauty and Mr. Stichtenoth has painted her with affection and reverence." 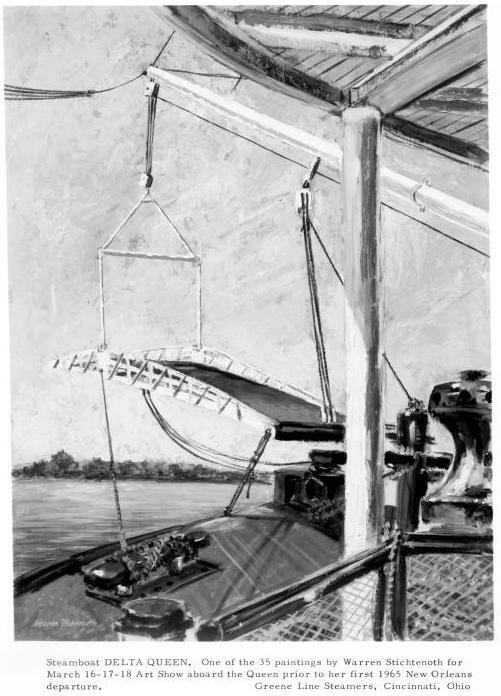 This is a black and white photograph of a color painting, inspired by a visit to the pilot house of the Delta Queen. This painting was first shown at the 75th Anniversary Art Show. 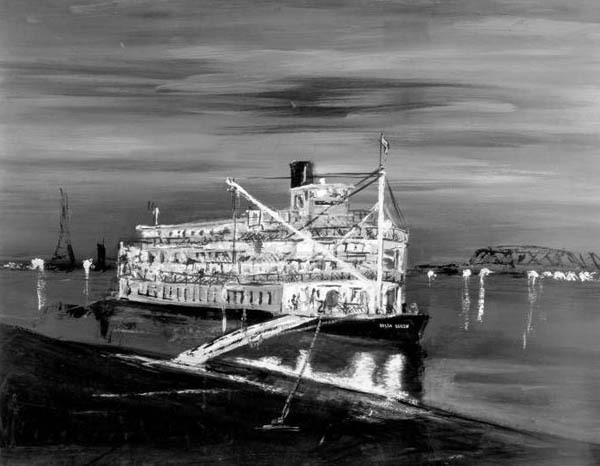 This is a black and white photograph of a color painting that was part of the 75th Anniversary art show aboard the Delta Queen in March of 1965. This photo was used for promotional purposes by Greene Line Steamers, as indicated in the wording below the photograph, and appeared in local newspapers and possibly other media. 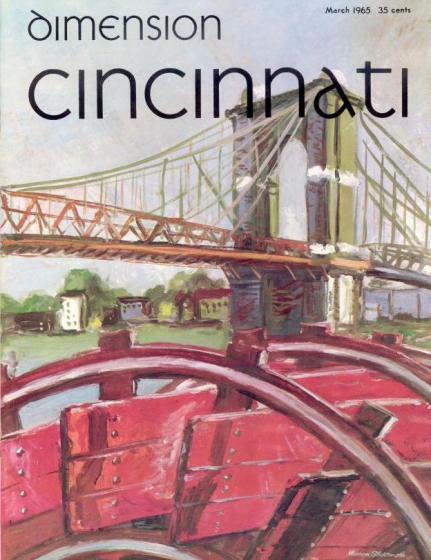 The March 1965 edition of "Dimension Cincinnati" magazine displayed this image of this painting. 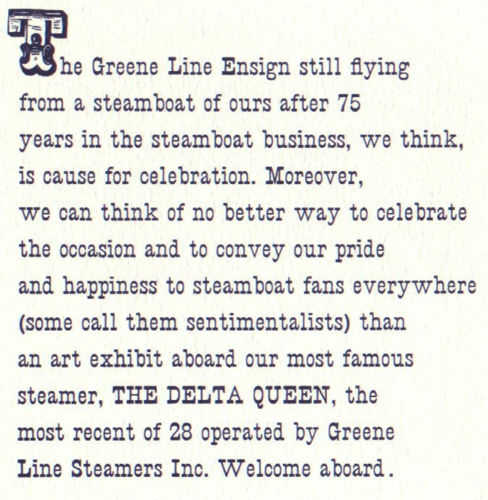 Inside the magazine was an advertisement for the art show aboard the Delta Queen on March 17 and 18, and an article entitled "How Greene Is Our Valley," that told the story of the Greene family and the history of Greene Line Steamers, Inc. This painting was shown at the 1965 art show onboard the Delta Queen. 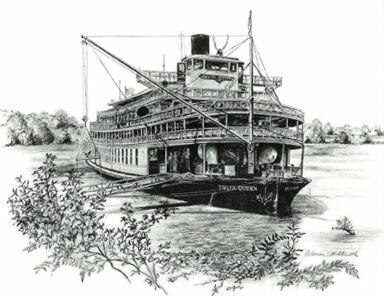 This image of the Delta Queen was used by Greene Line Steamers in a variety of different ways, including (1) the cover art on the invitations to the "3rd Annual Derby Festival Steamboat Race" between the Delta Queen and the Belle of Louisville" on Tuesday, April 27, 1965; (2) as the cover art for a jacket sleeve for a 45 RPM record featuring Harmon Mize at the Organ doing a "Showboat Medley" and a "Stephen Foster Medley." 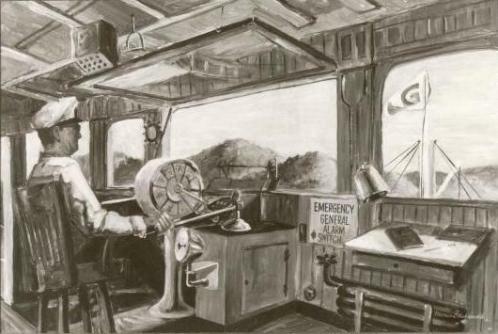 This painting from the art show aboard the Delta Queen was also used as the cover art for a special booklet titled "Greene Line Steamers Inc. celebrates its 75th Anniversary." 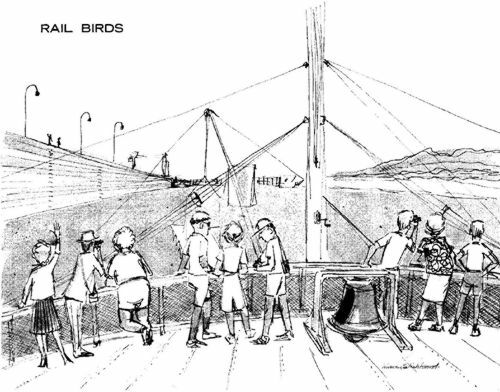 The booklet featured a history of the company and its many riverboats, and included photos of members of the Greene family and historic Greene Line riverboats with names like "H. K. Bedford," "Greenwood," and "Tom Greene." 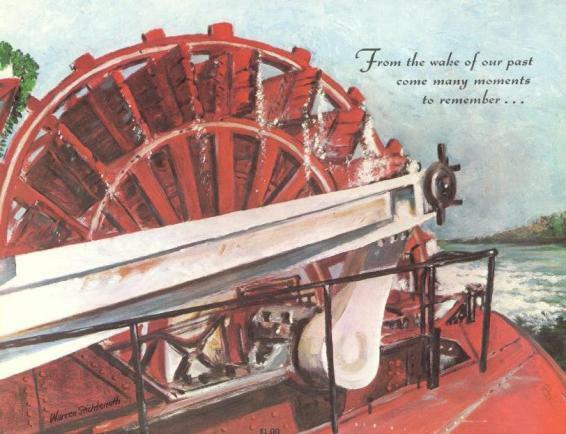 This image shows the wording that appeared on the cover of the booklet: "From the wake of our past comes many moments to remember. 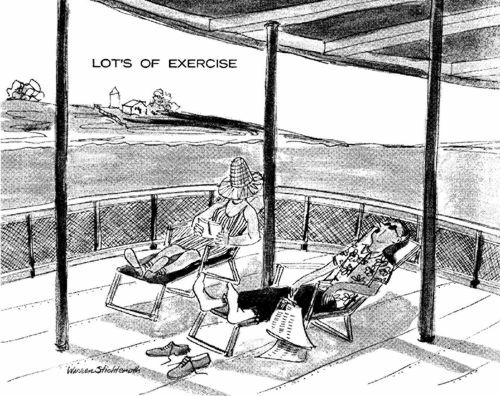 . ."
This wording and this image of the drawing entitled "Time Out" were featured on the inside of the program given to visitors to Warren Stichtenoth's art show onboard the Delta Queen in March, 1965. This painting was shown at the 1965 art show onboard the Delta Queen. 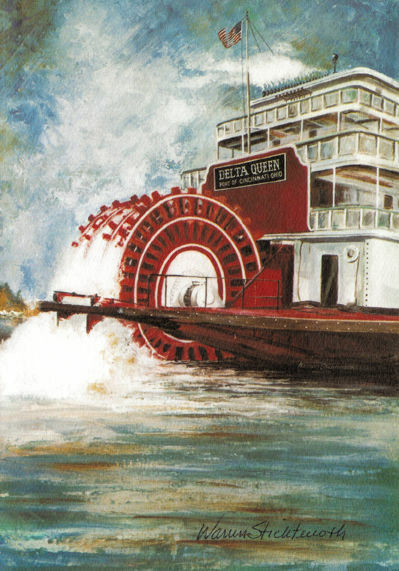 It was also used for a Mardi Gras-themed poster promoting the Delta Queen, and also on a Christmas card (as shown below). 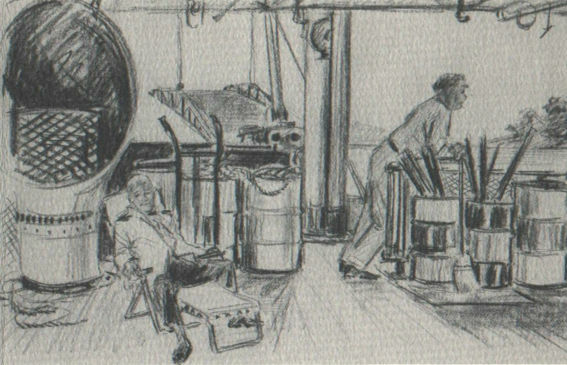 Four of seven drawings, done in a technique called ink and wash, which presented a more light-hearted look at life on the Delta Queen. These drawings were on display at the seventy-fifth anniversary art show onboard the Delta Queen. 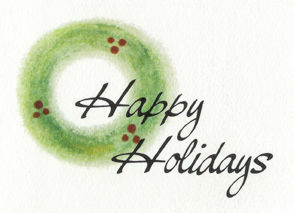 The drawings were made into note cards and sold in packs of seven in the Delta Queen gift shop. The back of each card reads: "Copyright 1965 Greene Line Steamers, Inc., Cin. Ohio." 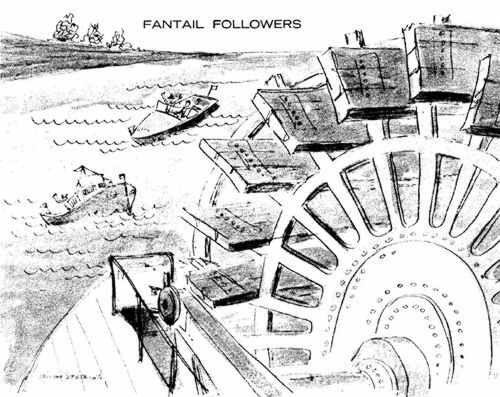 "Fantail Followers" was exhibited at a one-man art show at the Cincinnati Art Club in March of 1967. 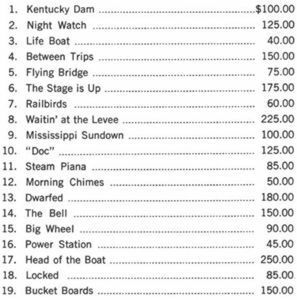 "Rail Birds," "Lazy Livin'" and "Port of Cincinnati," are still available as 11x17 prints (approx. size) and may be purchased from the artist's family. 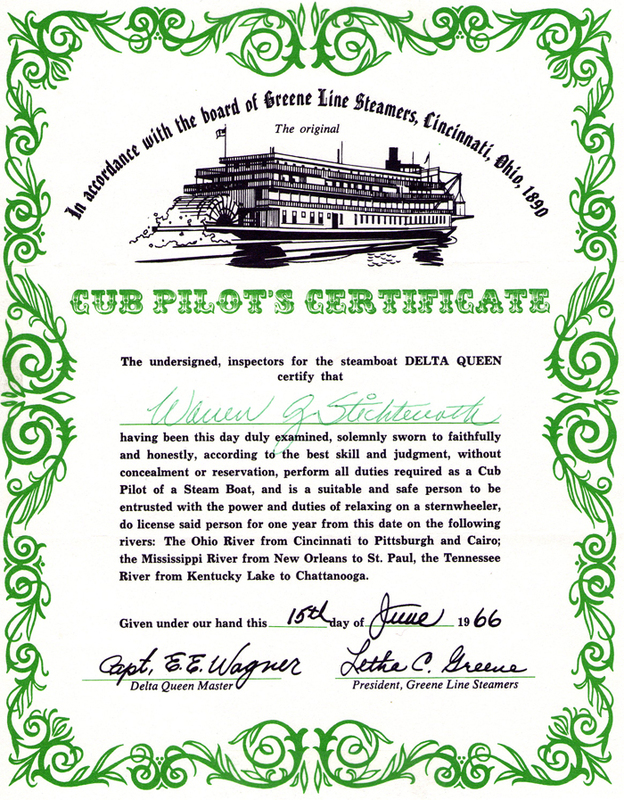 Cub Pilot's Certificate (below) graphic design by Warren Stichtenoth. 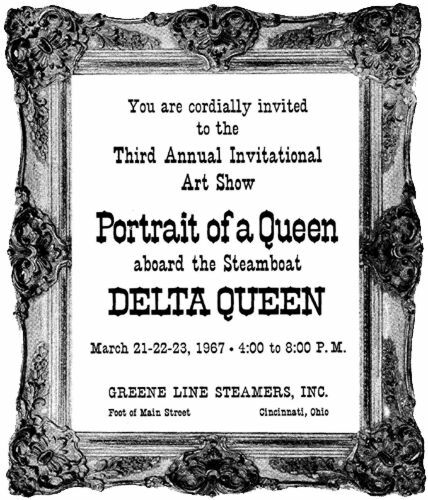 In March of 1967, the art show aboard the Delta Queen entitled "Portrait of a Queen" featured pieces by various Cincinnati area artists invited by Mr. Stichtenoth to offer their own artistic impression of the famed steamboat. This is the design for the front cover of an invitation to that art show. The art show "Portrait of a Queen" featured a number of prominent Cincinnati artists. Like Warren Stichtenoth, many of them were members of the Cincinnati Art Club, which was located in Mt. Adams and overlooked the city and the Ohio River. 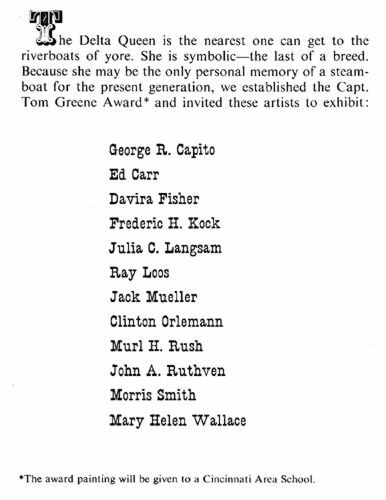 From the "Portrait of a Queen" brochure and artist list. 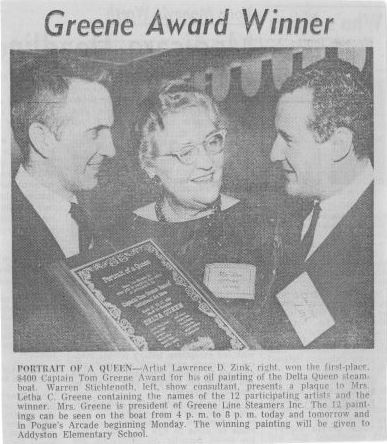 This photo caption shows Warren Stichtenoth, Mrs. Letha C. Greene who was president of Greene Line Steamers, and artist Lawrence Zink as he is being awarded the Capt. Tom Greene Award for his painting as part of the "Portrait of a Queen" art show. The newspaper clipping does not show the date, and thus this photo is a bit problematic in that Mr. Zink is not among the artists listed for the 1967 invitational art show "Portrait of A Queen," as shown on a previous webpage. This chalk drawing, showing the Cincinnati skyline and two of the artist's favorite subjects - the Delta Queen and the John S. Roebling Suspension Bridge - was part of a one-man art show in 1967. This piece was also featured on the announcement for the art show, which read as follows: "You are cordially invited to attend an exhibition of paintings and sketches by Warren G. Stichtenoth at the Cincinnati Art Club, 1021 Parkside Place, Mt. Adams, March 5 through 19, 1967, Gallery hours, 2 to 6 P.M. Saturdays and Sundays, Refreshments Opening Day."